Care2 Causes | Is It Time To Start Taxing Churches? Is It Time To Start Taxing Churches? As institutions of faith, churches are not forced to pay taxes like the citizens and (usually) corporations in the rest of the United States. The original argument was that, like charity, church profits and donations go to doing public good — feeding the poor, caring for the sick and other projects that help to build a better, stronger community, and that those advantages outweigh the tax revenue lost. Churches have grown to take greater advantage of this exemption. The surge in “televangelism” allowed many corrupt pastors to house themselves and keep themselves in luxury without paying taxes by declaring them allowable living expenses. Megachurches began popping up, buying cheap land to build on and using subsidies and avoiding paying property taxes while still taking full advantage of the services other residents pay out for. Some have businesses on site — coffee shops, book stores, all tax exempt by funneling their “profits” back into the church. Others have taken their earnings both from their businesses and donations and used them to evangelize and increase their missions, supporting the church and recruiting new members. All of this is legal. And despite the growing stretch of the definitions of non-profit, of charity, and living expenses, most Americans would agree that all of this should be allowed. But the only firewall that was set up is now breaking down. Churches weren’t supposed to get involved in political issues. No endorsing, no campaigning. It’s a rule that many religious organizations have been tiptoeing to the line on for years. “Family values” religious organizations have sanctioned off 501c4s to allow them the ability to advocate for candidates and issues, with donations kept separately from their main group and taxed accordingly. Pastors and priests have allowed candidates to come in and give testimony during services while winking that they aren’t endorsing a politician or party. And a growing number have actively endorsed despite the law against it, daring the government to come down on them. Within the last few years, the “evangelical vote” has been a major driving force behind elections, and the United States Council of Catholic Bishops has actively become a political force, sending missives to their priests telling them to preach to the congregation about the evils of the Affordable Care Act, or convincing the Komen Race for the Cure Foundation to drop Planned Parenthood as a group they donate to — a move that would free up more funding to go to Catholic charities and hospitals to provide mammograms. Again, totally legal, as long as they don’t advocate for a specific candidate. The churches are following the letter of the law, but not the intent. Religious institutions now get all of the benefits of tax exempt status, but have become one of the most politically active groups in the nation. Should churches continue to keep their tax exempt status while become key players in elections? Let us know what you think in the comments. Of course they should pay taxes, so should corporations. Pay taxes or shut your doors. Tax the bums or shut them down. YES! WIPE OUT THE DEFICIT. YES!!! Please start with the Roman Cathoilc Church. 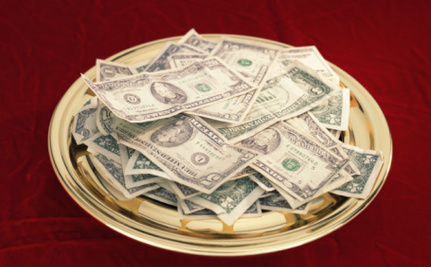 Churches make receive more tithe than what they were receiving. Also the progression of being a faithful has grown over the past few years. This is one method of uniting the faithful although most do not support this ideology. How can a few make a stand against the majority? A tax break for churches forces all American taxpayers to support religion, even if they oppose some or all religious doctrines. As Mark Twain argued: "no church property is taxed and so the infidel and the atheist and the man without religion are taxed to make up the deficit in the public income thus caused." Tax breaks for the churches actually require non-religious people to participate through them being taxed themselves. When we subsidies ANYTHING through tax breaks or direct funding, then we are placing those interests above everyone else. Tax exemptions for churches violate the separation of church and state required by the Establishment Clause of the First Amendment of the US Constitution. By providing a financial benefit to religious institutions, government is supporting religion. I conclude that this tax exemption is unconstitutional." Yes, they should pay taxes because they are enterprises not faith based organizations. Also, the mormon church had a huge impact on Prop 8 in California. If the mormon church hadn't poured millions and millions of dollars into the campaign, the outcome would have been different. Tax them like any other corporation and while you're at it, delete the disastrous Citizens United decision!